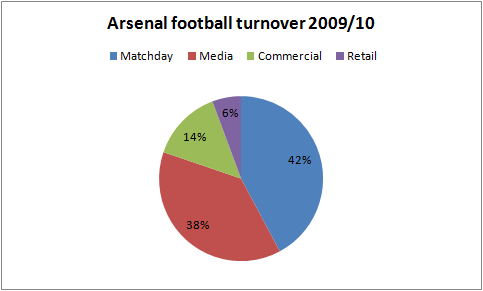 Arsenal Holdings plc today published preliminary results for the year to 31st May 2010 (full accounts will be available in due course). This is my initial take on the figures. The business is in very good shape overall. The strategy of borrowing to finance the building of the Emirates and the redevelopment of Highbury into apartments has clearly paid off. Net debt has fallen to £135.6m (2.4x football EBITDA) compared to a peak of £318.1m two years ago. All the debt incurred to redevelop Highbury has now been repaid and the Emirates financing is on a fixed rate of 5.3% with a maturity of around 20 years. The Highbury Square development generated operating profits of £15.2m, almost double last year's £7.8m. Now the property business is debt free, it should provide a useful fillip to cash flow in the next two years after which all sales will be complete. 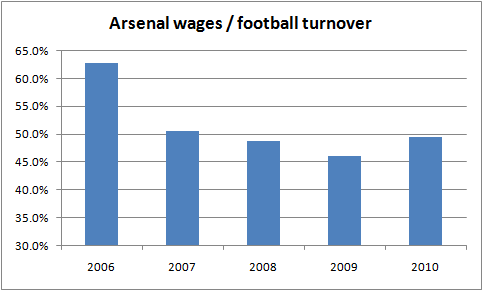 Football profits (before player sales) are down because of rising costs and flat turnover. Higher profits on player sales compared to the previous year means profit before tax is up. On these figures Arsenal will comfortably meet the new UEFA Financial Fair Play rules, in fact in this area it is probably the best placed of all the major English clubs. All general admission and "Club Tier" season tickets sold out for the current season. The stadium brings in almost £3.5m of revenue per home game which is almost as much as Old Trafford (£3.6m per home game in 2008/09) despite the latter having a capacity 26% higher. This impressive sales performance is only part of the story of course. The further a team progresses through competitions the more income is generated and matchday income actually fell 6% in 2009/10 due to fewer home games being played (there was no CL semi-final for example). Reflecting the improved Champions League TV deal that began in 2009/10 (and despite being knocked out a round earlier than the previous season), broadcasting income rose 15% to £85m. Arsenal significantly underperform United on media income due to a smaller share of the important CL "market pool" (Arsenal received €16.4m to United's €28.8m last year). The division of the pool is determined by the relative performance of clubs from each country and finishing places in the domestic league. Next year (in common with every other PL club), the new overseas rights deal means PL media income will rise by an estimated 10%. Commercial and retail turnover declined year-on-year with both areas seeing falls of c. 9%. The club blamed this on their "...sensitivity to the recessionary climate". Arsenal are miles behind United, Real, Bayern and Barca when it comes to commercial revenue and recruited a new Chief Commercial Officer a year ago to improve in this area. Overall, the increase in media income was not sufficient to offset weak commercial sales and the impact of fewer home games to leave football turnover down marginally. "...there continues to be very strong upward pressure on players' wage expectations." The wage pressure and slightly weaker turnover meant that EBITDA (before the impact of player sales) fell 13.5% year-on-year (a decrease of 375bps in the margin to 25.7%). The player amortisation charge rose by a moderate 4.8% to leave football EBIT down 34% at £20.4m. Thankfully for the club, the sales of Adebayor and Kolo Toure to the ever generous Manchester City generated a profit of £38.1m vs. £23.2m in the prior year. This allowed EBIT including player sales to actually rise 8.5% to £58.5m. 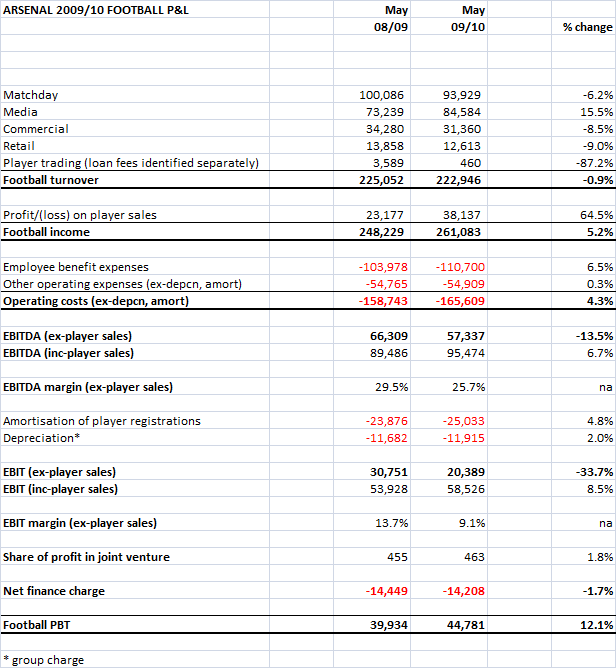 Football interest costs (the Emirate bonds) were down 1.7% to leave football PBT up 12.1% at £45m. Arsenal is a very well run club. Debt is totally under control, the business is profitable and cash generation is strong. Industry pressures (and underperformance on the pitch) means, however, that there is little growth in the business. These results also tell us quite a lot about the current economics of English football. For those clubs with large modern stadiums, matchday still remains the most important element of turnover but growth in this area is hard to come by and revenue is of course highly dependent on the number of home games played. The current growth cycle from media is clearly illustrated in these figures with Arsenal showing an increase year-on-year despite a weaker performance on the pitch as the new CL deal kicks in. But media growth is not a one way street and at 37% of media income the importance of CL qualification is obvious. I remain sceptical about ongoing football rights inflation. The domestic PL rights for the next three years have declined in real terms compared to the last deal perhaps showing early signs of maturity. International growth has been phenomenal, but may also be nearing a peak with some broadcasters now paying more per capita for PL rights than Sky/ESPN in the UK! Commercial and retail revenue is obviously under pressure from the recession and with the prognosis for the UK economy dull at best, this trend seems likely to continue. Arsenal are determined to catch up with the best in class performance of United and the major Spanish clubs. Whilst revenue for Arsenal and for most large English clubs looks to be stagnating, cost pressures remain very pronounced. Many hope that limits on squad sizes and the new UEFA Financial Fair Play regulations will moderate transfer and salary inflation, but there is no evidence of that from these figures. "There has been very limited player sale activity during the summer transfer window. As a result, in contrast to each of the previous three years, we do not have a significant profit on disposal of player registrations on the books at this stage of the new financial year. Subject to any transfer activity in the January 2011 window this may impact the final level of profits to be reported for the financial year 2010/11." The flipside to lower receipts from sales may in the longer run be lower amortisation charges for clubs, but in the shorter term the impact may well be negative. These results show what a prudently financed, well managed football club should look like. The sharp decline in net debt (debt taken on only for the purposes of investment, not to finance an LBO) stands in stark contrast to position of Manchester United and Liverpool. Finance does not of course win trophies, and it has been five years since Arsenal has won one (and that was totally undeserved), but in a difficult world Arsenal look financially well placed. The Glazer family are rich, asset rich. They own what is generally considered to be the world’s most valuable football club and an NFL franchise. But what is their net worth? Given that the two key assets in this calculation are sports teams, it’s handy that Forbes also provide its own valuations for those, the most recent being their 25th August 2010 valuation of the Tampa Bay Buccaneers and their 21st April 2010 valuation of Manchester United. Forbes’ sports valuations are always calculated as “enterprise value”, that is the combined value of debt and equity (unless the debt relates directly to stadium construction which is not relevant in these cases). Forbes also helpfully show what proportion of this “team value” estimate relates is debt. So where do Forbes get the other c. $1bn in their estimate of the Glazer fortune from? This 4.7m square foot of space is generating around $6m per annum in cash flow at present (that isn’t an estimate, it’s from the CMBS filings each centre makes), that’s before any central business costs. Is that worth $1bn? The answer is clearly no. Only half the centres generate any positive cash flow at all. Putting them on a capitalisation rate of 8.5% yields a value of around $70m. Which still leaves a $889m hole in Forbes’ big number. Maybe the Glazers have over $800m just sitting around? If that were true, why not repay all the PIKs? Or invest in the Bucs playing squad? It sounds unlikely. So Forbes end up looking pretty dumb for not being able to add up their own numbers or include $283m of PIK debt in their calculations and the Glazers look asset rich but suspiciously cash poor. September's shopping centre is "The Terraces at University Place" in Charlotte, North Carolina. It missed its most recent mortgage payment which was due on 11th September. The vacancy rate across First Allied's portfolio increased slightly compared to August (up to 11.3% from 11.1%). Vacancies rose at seven centres and declined at five. 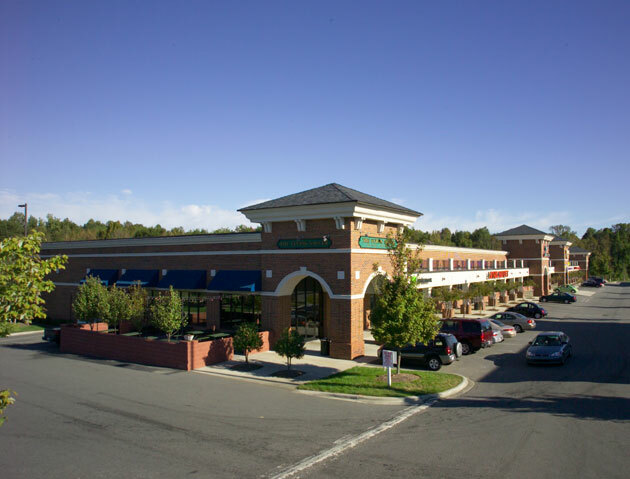 "The Terraces" has c. 65,000 square feet of shopping space divided into 26 frontages. Five of those lots accounting for 23% of the space are currently vacant. The occupancy rate has gently declined over the last three years (from 85% at the end of 2007 to 77% today), but in recent months the rate has actually ticked up (from 75% in June). So why would The Terraces stop paying its mortgage all of a sudden? In an interesting piece in the Tampa Bay Tribune on First Allied's problems, Mary MacNeill a ratings analyst at Fitch was dismissive of reading too much into loans going delinquent for a short time saying; "If it's just one month in the summer, that could be just a vacation." I'm happy to agree that in normal circumstances cheques can get lost in the post and payments missed only to be made good by borrowers when the mistake is noted. In the case of First Allied Corporation however, we have the benefit of more information and an extensive pattern of behaviour. In addition to the Terraces, five other First Allied centres are currently delinquent; two are two months late on their payments, one four months late, and two five months late. None of these older delinquencies has so far proved to be a clerical error. One would imagine such "errors" would be swiftly spotted by borrower and/or lender and corrected. In fact three of the five properties have already been placed in the hands of the "Special Servicer" which works out problem loans. None of these delinquencies appear to be mere clerical errors. Then we have the four former First Allied centres that we know have already been foreclosed on and seized by the lenders. After these centres went delinquent, they never corrected their missed payments either. They just stopped paying their mortgages and were eventually foreclosed. Returning to The Terraces, and looking more closely at the data, the reason for the delinquency is quite clear. The original Lehman Brothers mortgage was taken out in August 2005. It's a fifteen year balloon loan with a five year interest-only period. So for the last five years, the interest only payments have been $895,000 pa (including payments on the "B loan"). Now the interest-only period is over and from 11th September onwards, The Terraces need to make capital repayments too. The balloon payment at the end of the mortgage is c. $11.2m and the total loan $13.34m, so that's $2.08m of capital to be repaid over the next ten years, an additional $208,000 per annum. Put simply (and you can see the numbers from the CMBS trustee's spreadsheet here), the centre cannot afford these new payments of c. $1.1m. In the first six months of 2010 it only generated $416,269 of cash flow, or $832,538 on an annualised basis. First Allied and the Glazers therefore have a choice, to support the centre with equity injections in the short-term, hoping that occupancy or rental rates rise, or to stop paying and let the centre go to the wall. Other centres in similar positions (weak occupancy and interest-only periods ending) ARE being supported in some way, they have not gone delinquent yet. Perhaps I'm wrong about this, and a late bank transfer and an apology will roll out of Rochester to make good the missing mortgage payment in the next few days. Or perhaps, more likely, this is tenth First Allied shopping centre on starting on its way to foreclosure. When I last wrote on this subject, various people pointed out that "walking away" from over-indebted commercial real estate was often a smart move in the current market and didn't prove that the owners couldn't cover the loans, just that there was no point throwing good money after bad. I totally accept and understand this. I have never claimed that the escalating problems at First Allied Corporation somehow "prove" the Glazers have no money, in fact their support for many centres that couldn't otherwise pay their mortgages shows the opposite. So they bought the PIKs in 2008, where did they get the money? Since Bloomberg revealed that the Glazers picked up around 20% of Red Football Joint Venture's PIKs in 2008, people have been asking "where did they get the money from?". "The Americans, who also own the Tampa Bay Buccaneers, may have paid as little as 12.6 million pounds ($19.6 million) for the stake if they bought it at 35 percent of full value." A wise man who posts under the name "redloner" on various United forums has a very good answer, pointing out that the Glazers' actually borrowed £10m from Manchester United on 19th December 2008. Nothing illegal, nothing wrong, either here on in the US. Just something that, funded off the worship of thousands for an incredible football club seems to me to be wrong, wrong, wrong. Tariq Panja at Bloomberg has done some cracking, old fashioned investigative journalism and has discovered that the Glazer family themselves bought around 20% of Red Football Joint Venture's infamous Payment in Kind loans ("PIKs") in 2008. During 2008, at the height of the financial crisis, hedge funds all over the world were faced with huge redemptions from clients trying to cash in their investments, in total hedgefund.net estimated that $512bn was withdrawn from funds. The panic to get money out led to many funds becoming forced sellers of very illiquid assets which in turn threw up bargains for those who had cash to buy such assets. It appears that one of the funds holding the PIKs found itself in this situation and the Glazers took advantage, paying around a 50% discount for PIKs with a face value (at that point) of around £36m. This was a smart trade by the Glazers by any standard, neutralising the risk of how to repay this slice of the debt at a very reasonable price. If left unpaid, by the time they reached maturity in 2017 this 20% element would represent a c. £130m liability for the Glazers on its own. But does this change things materially for Manchester United Football Club? In my view the answer is no. The enduring mystery of the PIKs is why the Glazers have let them escalate to the extent they have over the last four years. 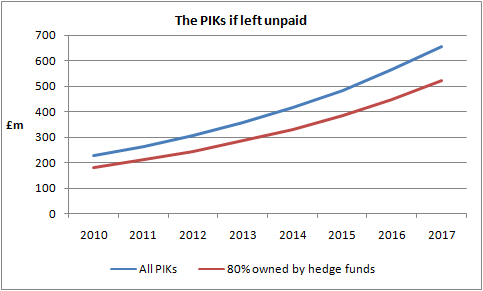 At 14.25% (now 16.25%) interest rates, the PIKs represent some of the most expensive corporate debt imaginable. Replacing them with any other form of borrowing would make sense, using any available cash the family had would make sense, leaving them to build makes no sense at all. Why (other than this purchase of 20% in 2008) haven't the family repaid them? It seems logical to assume that they can't, that they haven't got the money available or assets they can borrow against. All the evidence from their other businesses points to this being the case. So despite today's story, the situation seems to be this; the 80% of the PIKs still owned by various hedge funds (current value around £185m and growing at 16.25% per annum) have to be repaid or the Glazers lose the club. Other than spending £14m two years ago, no action has been taken to repay them and the only obvious source of the money to do so is Manchester United Football Club. Today's news is good for the club, but still leaves a huge sum to be repaid (see chart). The club have to publish their accounts by 27th October. Strong indications are that none of the £95m that could have been paid out to Red Football Joint Venture had gone at the financial year end (30th June). The question is, has this money gone since that date? Companies are obliged to publish a note of significant "Post Balance Sheet Events" in their accounts. If this money has gone we can expect that note to tell us. Of course David Gill or Joel or Avram or somebody could just tell us the plan for the PIKs, but why would they want to talk to supporters? 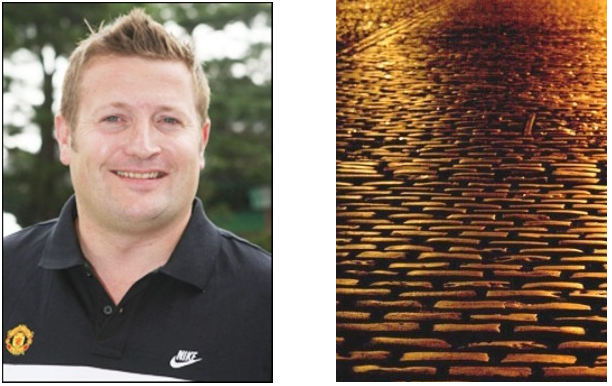 MUTV: “Is this the road paved with gold?” Probably not. "....makes the company the Official Integrated Telecommunications Partner and Official Broadcast Partner of United in Hong Kong". This basically means that PCCW will have exclusive rights to broadcast MUTV, MUTV online and MU Mobile content in Hong Kong. These will be available on the "now TV" platform as well as PCCW's other "quadruple-play" services. ""We continue to support the collective bargaining because it makes the Premier League incredibly competitive... But there are other rights that centre around the club and players, where our access is not paralleled anywhere else. It would be very surprising not to put into place something that allowed you to communicate with fans all over the world." "Is this the road paved with gold? Put it this way, a football club has three sources of income; ticketing, sponsorship and media. Media has become the lion's share of that cake through collective bargaining. But the element left over could also be very significant." Richard Arnold needs to ask Ed Woodward for a quick look at his big Excel spreadsheet as media, at 36% of last year's revenues, isn't even the largest source (that's "matchday") let alone the "lion's share". Putting that to one side, could Arnold be right about the potential for club owned rights? Is this the road paved with gold? Let's take a look at MUTV. Manchester United own 66.6% of MUTV Limited having bought out ITV plc's 33% stake in 2007. The remaining 33.3% is owned by BSkyB plc. The club is very coy about the channel and to my knowledge has never published subscriber figures since the 2005 takeover. The 2004 report and accounts said that subscriptions for the year to July 2004 averaged 95,000 over the year. Last July, David Gill was quoted in Australian FourFourTwo as saying that (depending on the time of year) the channel had "anything between 80 and 100,000 subscribers". Certainly, MUTV is not a substantial business. Turnover in the year to 30 June 2009 was £6.9m of which £4.9m came from the UK. The channel represents 6.9% of the club's media turnover, 2.5% of total turnover and a tiny 0.6% of EBITDA. Nor has MUTV grown over recent years, 2005 turnover was £7.4m. Although the channel made a pre-tax profit of £284,000, after paying the interest on loan stock of £11m (£6m from United and £5m from Sky), the most recent accounts showed a loss of c. £270,000. MUTV is not cash positive and has never paid its shareholders a dividend. "It means, for instance, that supporters will have access to Sir Alex Ferguson's weekly press conference at 12 noon UK time, barely two hours after it has concluded. With reserve team games, pre-match Premier League build-up as well as post-match phone-ins, it is the nearest fans are likely to come to the club without access to the actual matches themselves." "It will never get huge numbers of people without the rights and we will never have them. What we have done are little things like pulling the advertising slots back so we can offer to our partners. It is not going to help buy a star player but it is a very important part of our future and I am content with where it is. Yes we would like it to have 300,000 but that is not going to happen - and if MUTV can't, no-one else can." Returning to Hong Kong and Arnold's "road paved with gold", it's important to see through the hype. MUTV's 80-100,000 subscribers come primarily from the UK and Ireland, combined population c. 68m. How many subscribers will PCCW pick-up from Hong Kong's 7m people? How many will want to watch press conferences and re-runs of games they could have watched live? No doubt United will do more deals like the PCCW one and that's a good thing, with programming costs fixed, profits will surely rise as more distribution deals are signed. But if the UK can only generate £5m of revenue for MUTV almost twelve years after launch, it is hard to see this as something that will ever make a significant difference to the club's finances.